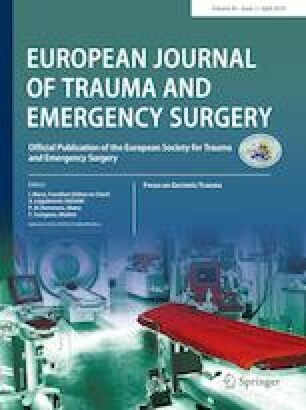 Penetrating abdominal injuries caused by stabbing or firearms are rare in Germany, thus there is lack of descriptive studies. The management of hemodynamically stable patients is still under dispute. The aim of this study is to review and improve our management of penetrating abdominal injuries. We retrospectively reviewed a 10-year period from the Trauma Registry of our level I trauma center. The data of all patients regarding demographics, clinical and outcome parameters were examined. Further, charts were reviewed for FAST and CT results and correlated with intraoperative findings. A total of 115 patients with penetrating abdominal trauma (87.8% men) were analyzed. In 69 patients, the injuries were caused by interpersonal violence and included 88 stab and 4 firearm wounds. 8 patients (6.9%) were in a state of shock at presentation. 52 patients (44.8%) suffered additional extraabdominal injuries. 38 patients were managed non-operatively, while almost two-thirds of all patients underwent surgical treatment. Hereof, 20 laparoscopies and 3 laparotomies were nontherapeutic. There were two missed injuries, but no patient experienced morbidity or mortality related to delay in treatment. 106 (92.2%) FAST and 91 (79.3%) CT scans were performed. Sensitivity and specificity of FAST were 59.4 and 94.2%, while those of CT were 93.2 and 85.1%, respectively. In hemodynamically stable patients presenting with penetrating abdominal trauma, CT is indicated and the majority of injuries can be managed conservatively. If surgical treatment is required, diagnostic laparoscopy for stable patients is feasible to avoid nontherapeutic laparotomy. Patrizia Malkomes, Philipp Störmann, Hanan El Youzouri, Sebastian Wutzler, Ingo Marzi, Thomas Vogl, Wolf Otto Bechstein and Nils Habbe declare that they have no conflict of interest. All procedures performed in this study involving human participants were in accordance with the ethical standards of the institutional research committee and with the 1964 Helsinki declaration and its later amendments or comparable ethical standards. For this type of study formal consent is not required.